Totally a layering shade, so I thought I’d just see how many coats it needed to achieve opacity. One of the best applicators of the Summer of Love set, this glides on the nail and dries quickly. 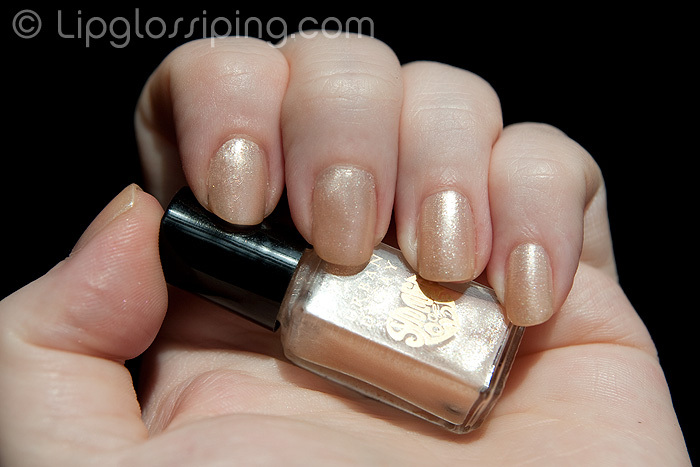 Once opaque, it’s a beautiful pale gold shade with a lot of sparkle. It’s feminine without being too floaty. I like it more than I thought I would on initial inspection. Sadly it has chipped in two places along the cuticle edge which is rather odd, I think it may have more to do with a heavy handed application of top coat though… which renders that last statement rather useless. I’ve got one more shade to show from the Summer of Love kit.. I know it’s practically old news now, but I’m determined to get them all blogged for swatch purposes! This photo reminds me of Mastermind for some reason. I think it’s the bright light and the dark background . Now to the polish, it is not a colour I would choose for myself because I think it’s a nudey colour and my fingers are no way that light. Ooh, this looks gorgeous! I’m such a magpie. I love those shimmery beiges myself, but I find it can be quite tricky to get the right one for my skintone…!